The concept is very simple. We’ve provided a lot of cord to allow for a bunch of different options for the length of your piece. First, cut the cord in two identical length pieces (two yards each). The holes in the cord are large enough to fit the metal bars. 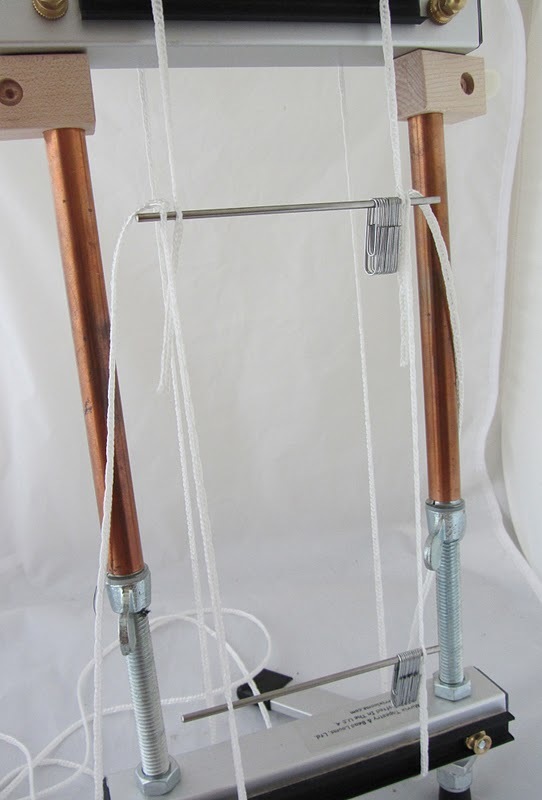 The following photo illustrates how you want your loom to look once it is warped. How to put the cord and bars on your loom. 1) Slide the required number of paper clips on each bar. If you don’t put enough on, don’t worry because you can always add more while the bars are on the loom. If you put on too many, you can slide the clips to the side. In this example, we used five clips on the top and five on the bottom for a piece that will be nine beads wide. 3) To attach the bottom bar, first measure down from the bottom of the paper clips of the top bar to the place on the cord that is the length of the piece you want to weave PLUS the length of the paperclips on the bottom bar. So if your piece is going to be six inches long, you will measure down six inches plus the length of the paperclips. Simple stick the bottom bar into the two cords at this place. It will easily slide into the holes of the cord. 4) Refer to first photograph. In order to warp the loom, simply tie to either a top or bottom paper clip and then in a zigzag pattern slip your warp through the top and bottom paper clips until you have as many warps as you need. Tie off on final paper clip. 6) Evenly space the paperclips. Apply tension on the loom. Begin weaving as you normally would. The beads will space the warps as necessary and the paper clips will make sure warps do not tangle or cross. 7) Weave until you have a space one bead wide on top to allow for shrinkage once piece is removed from the loom. 8) If you plan to weave another piece of the same length, replace the cords on the top bar so that when you remove your piece the bars remain attached to the loom. Reduce the tension on the loom and slip your piece out of the paper clips. 9) The only remaining finishing will be to weave in the two warp ends. I had a baby loom that used a similar technique only instead of paperclips it was a row of beads strung to the top and bottom of the loom. The beads acted as spacers and the warp thread zigzagged through them like here with the paperclips. These beaded rows then became part of the beaded fabric, so meticulous planning was very necessary! The problem was that it was physically really difficult to get the warp threads through the beads because they were strung really tightly together. I could go through several needles trying to do this and I've since given up on the loom. Your system seems much better! However, my constant concern with no-warp looming is determining the length of the warp incorrectly. What if I run out of pattern, or make the warps too short? 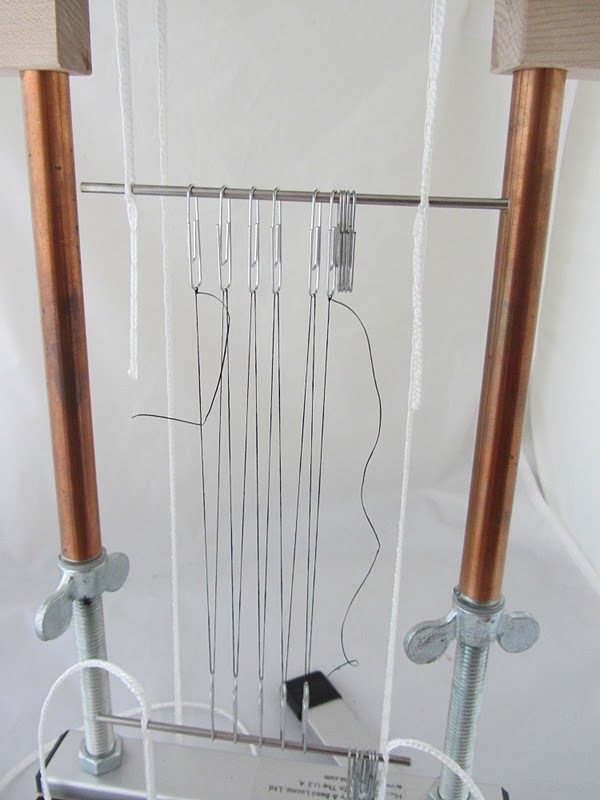 Anyway, I'm going to have to look at this when I go pick my loom next year, it's very intriguing!